What’s more stereotypical than a pregnant woman posting about pickles? Go ahead, laugh. But you’ll be glad I shared. Pregnant or not, I’ve always loved pickles, but I used to be scared of making them, or anything else requiring mason jar rings and lids, and words like sterilization, acid levels, and bacteria. 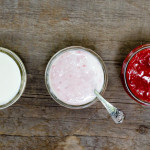 I wasn’t pumped, either, about spending half a mid-summer day sterilizing jars in boiling water, trying to seal them without actually touching them, and then worrying, every time I spied them in the pantry, about whether the seal was actually sealed. 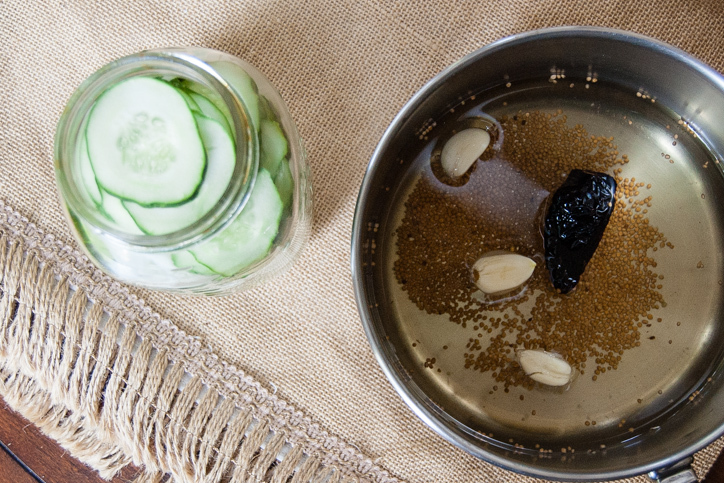 When I finally tried pickling in restaurants, I realized it’s really no big deal. You don’t have to seal pickle jars, or anything else you’re planning to eat right away. 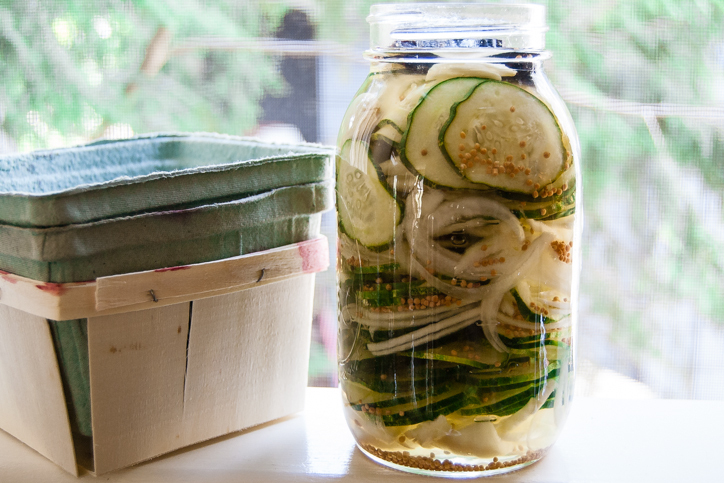 The vinegar and salt will preserve the vegetables in the refrigerator for three weeks or so (and honestly, they’ll be gone in a week, tops) so all you have to worry about is finding fresh cucumbers and flavorful brine. The process is easy too: Dissolve sugar and salt in simmering water and vinegar, add some spices, and pour it over the sliced cucumbers. 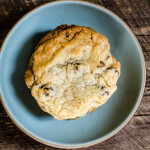 Let the whole thing cool to room temperature, refrigerate overnight, and you’re DONE. It takes about half an hour, especially if you’re only working with a small batch of six or eight pickling cukes nabbed at the farmer’s market because they were too green and perfect to ignore. This recipe yields 1 quart / 1000 ml, or 2 pint-sized jars of pickles, and is easily doubled or tripled. If you don’t feel like adding the onions, increase the amount of cucumbers to 1 ½ pounds. 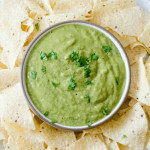 When sliced 1/8-inch thick or so, they are crunchy, sweet, and tangy. One dried chili will tickle the back of the throat but if you’re looking for more of a kick, add three or four pods to the brine. Refrigerate the pickles for eight hours or overnight before serving to allow the flavors to develop. Peel the onion and cut off both ends. Slice thinly with a sharp knife, about 1/8-inch thick. 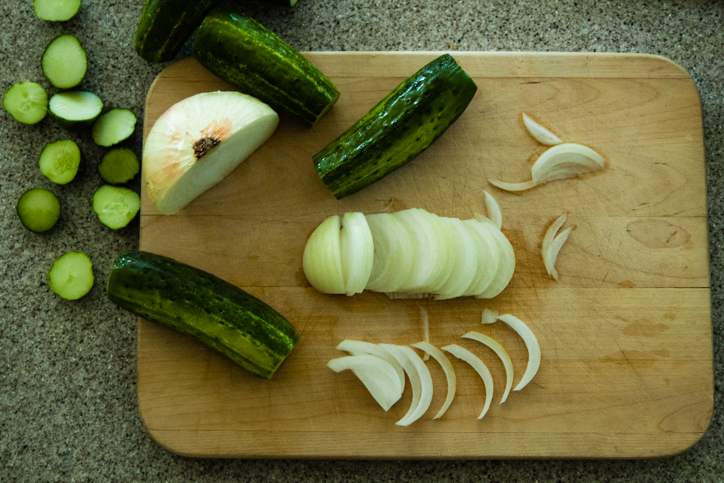 Cut the ends off of the cucumbers and slice them 1/8-inch thick with a knife or mandoline, if you have one. 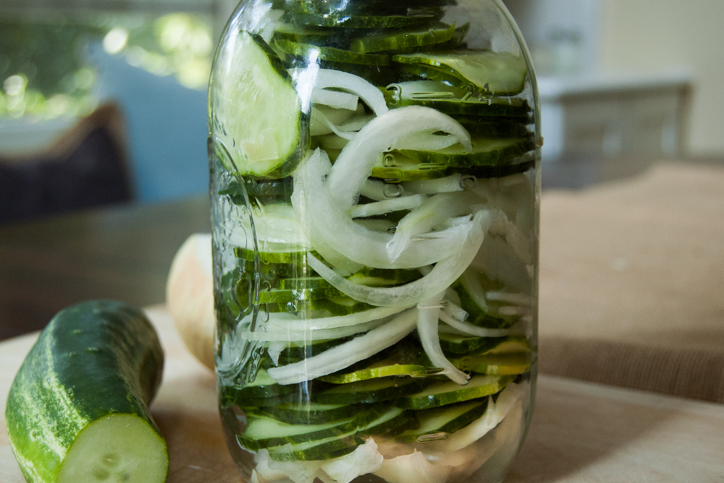 Layer the onions and cukes in a quart-sized glass jar, or two pint-sized jars. Squish them in tightly - they’ll loosen up once the liquid is added. Heat a small, 1- to 2-quart pan over medium heat. Add the vinegar, water, sugar and salt and bring up to a simmer, stirring until the sugar and salt are dissolved. Remove from the heat and add the garlic, mustard seed, and dried chili. Reserve about ½ cup liquid from the pan and carefully pour the rest over the sliced vegetables. Depending on the size of the mouth of the jar, you may want to use a funnel. Make sure all the spices are added. Don’t worry if they sit at the top at first, they’ll sink to the bottom eventually. Add the reserved pickling liquid up to the top of the jar. Let cool until the liquid reaches room temperature, about two hours. Fit with a tight lid and refrigerate for 8 hours or overnight, flipping the jar back and forth occasionally to distribute the spices. The pickles will keep for up to three weeks in the refrigerator (if you don’t eat them all first!). 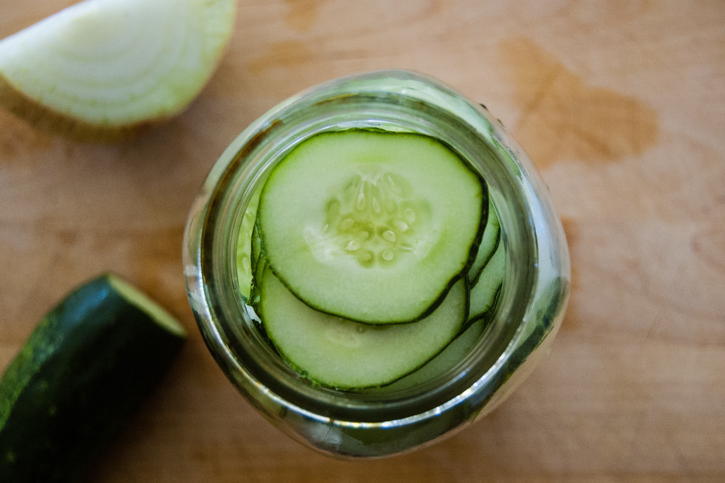 Don't throw away the pickling liquid when the pickles are gone - it makes a great substitute for vinegar in dressings for cole slaw and potato salad.